Being outdoors and camping is typically a safe and happy time. But occasionally, we hear of campers who have had the misfortune to be the victim of a person(s) who care for no-one but themselves, and are intent on ensuring that rather than work for their own belongings, it's easier to steal someone elses gear. So far, we have never encountered problems with our gear when camping, despite leaving it for hours unattended. But other campers have returned to campsites to find their belongings stolen, eskies full of food (and medications) taken and even entire tent gone. Recently, a reader of this website enquired about what they could do when camping to ensure the safety of their gear .... which inspired this story. Here in Australia, most campers are there to help each other when needed, and don't have intentions to steal, but it is better to follow the old adage "better safe than sorry". Here is a list of tips to help with campsite security and hopefully preventing your camping gear getting stolen. If you are not around your campsite during the day, then anything you consider truly valuable and would hate to see go missing, then lock it away in your car, and out of sight from prying eyes. Camping remotely, with no-one around for miles, does lessen the chances of someone wandering through your campsite, but if you are not at the campsite, and someone does happen to come upon your set-up, you want nothing left outside to tempt them. If you are in a more crowded campground, don't wander off without putting away that valuable item. Temptation can be too much for someone walking by. At night, when you go to bed, then the same rule applies: lock it away in the vehicle, and LOCK your vehicle!! Unfortunately, I have read of stories of campers who have had camping gear stolen during the night as they slept. This is not common (to my knowledge) and you can't put away everything at night, because packing it all in the car, and then unpacking in the morning is no fun for anyone. So you need to make some choices about what you feel comfortable leaving unattended during the night. You might think you would wake up if anyone came near, but camping can make you sleep more soundly, so don't rely on being a light sleeper. Of course, unattended vehicles with hidden valuables can be at risk - anywhere. Not just camping. So, if you are planning to be away from your car for agreat length of time, minimise bringing anything of high value with you on the trip in the first place if you can't keep it with you at all times. Don't spread your gear far and wide around your campsite. Keep it orderly and near where you are most of the time. If your campsite is close to where others walk by, seeing an item, set away from the rest of your gear could be too much for someone with theft on their mind. It would be easy to take something without you being aware of it immediately. In areas with high foot traffic, or close to roads, your gear is more visible. Keep it close. Some items that are expensive, like portable fridges, have been known to be stolen. A chain and padlock for any item that is large enough to be outside could be an investment for you. Just because you have put your fridge, or BBQ in the annex of your caravan or trailer, doesn't mean it's safe. Yes, it's away from inquisitive people, but still could be vulnerable to theft. If you have anything that you think could "walk" and isn't easily put back in to a locked vehicle, then you should think about securing it with some sort of lock. Some suggestions have been a cable lock with an alarm (for around $20+), which should the cable be cut or tampered with, sets off an alarm. Thieves are opportunistic, and want to get in and out as fast as they can. Padlocks can be a deterrent. Not fail safe, but it's a start. Bikes should be secured as well. It might be worthwhile to lock them back on a bike rack on the car if available. If you are camping near others, it doesn't hurt to say hello and have a little chat when setting up or passing by. It doesn't have to be a big deep and meaningful conversation, but you can sometimes get an idea about them and their camping. Campers generally look out for each other, and having made that little introduction could mean that they will watch over your site and you, over theirs, should one of you be absent. I am not saying, trust everyone because you have had a chat, but most people are not there to steal from a fellow camper. Another set of eyes on your campsite could be enough of a deterrent to a thief. Watch out for each other and look out for anyone wandering through campsites that look like they don't belong. As we don't have a caravan, we don't know about all the ways you can keep your these vehicles safe from theft - because this is a growing issue in Australia. The site Without A Hitch, has written 11 tips on how to secure your caravan, and if you own a caravan, it's worth reading and finding some useful tips. For camper trailers, the site Campertrailers.org have a story on preventing theft of camper trailers. See the story on securing your camper trailer here. If you have had a caravan/RV/camper trailer etc. stolen or want to check up on a vehicle to see if it's stolen, a registry is now available. Tip 6: Zip it up - or not? 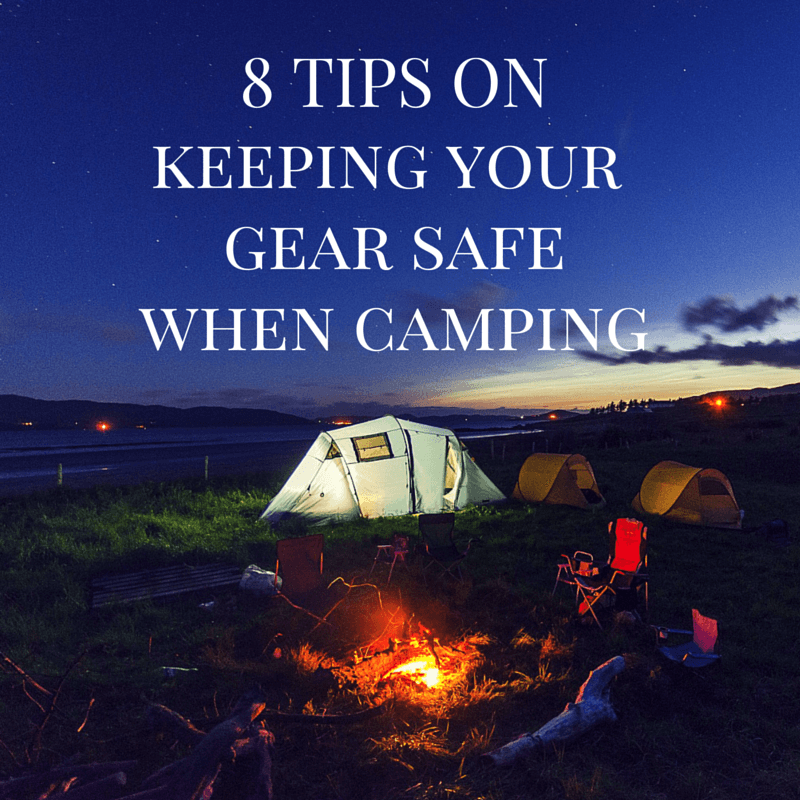 There seems to be different ideas on whether or not you zip up your tent, to keep your belongings safe (and I am not talking about valuables like phones etc, but more the everyday camping gear). So here are some thoughts on should you or should you not zip the tent up ......up to you on what you think is the best option! Zipping up your tent tightly when you are away from camp could be a sign to a thief that the campsite is empty. A zipped up tent, with or without a small padlock, could take too much time to enter, so entry at the back of the tent with a knife through the side of the tent would be easier. As you can see, there are 2 schools of thought on shutting your tent securely. What do you think is the way to go? The most important thing to remember - never keep anything of true value in a tent. "It's strange how common sense isn't that common anymore"
All the safety tips about keeping your gear secure when you go camping may not prevent some piece of scum stealing your belongings. In Australia, it does happen but it doesn't happen often. So when you go camping, bring your common sense. Think about what valuables you need to take on your camping trip, and then do your best to keep them secure. Common sense is not leaving items in easy reach of anyone nearby. Common sense is locking your car. Don't sleep with all your valuables in the tent (a locked car is better for them). We have heard of campers waking to find someone has slashed their tent to access handbags and personal belongings. No piece of gear or valuable item like a phone, jewellery, or wallet is worth putting yourself in danger for. Confrontation with a thief could result in them running off, but it could also mean getting yourself into a situation you may not be prepared for. Use that common sense that we just mentioned. Camping in Australia is generally safe and whilst theft does occur, these are just a few simple ways to help minimise the chances of you being a victim. Remember if you are victim, report the incident to the police, and check your insurance policies to see if your policy provides coverage for the theft when outdoors.